Property Location With a stay at Hostal Pachacuteq Inn in Cusco, you'll be minutes from Garcilaso de la Vega Stadium and Cusco Craft Center. This hostal is within close proximity of Plaza Tupac Amaru and Centro de Textiles. Rooms Stay in one of 16 guestrooms featuring LED televisions. Complimentary wireless Internet access keeps you connected, and cable programming is available for your entertainment. Bathrooms have showers and complimentary toiletries. Conveniences include desks, and housekeeping is provided daily. Amenities Take advantage of recreation opportunities such as a nightclub or take in the view from a rooftop terrace and a garden. 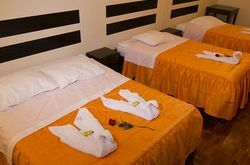 Additional features at this hostal include complimentary wireless Internet access and concierge services. Guests can catch a ride to nearby destinations on the area shuttle (surcharge). Dining A complimentary continental breakfast is served daily. Business, Other Amenities Featured amenities include a 24-hour front desk, luggage storage, and a safe deposit box at the front desk. A roundtrip airport shuttle is complimentary (available 24 hours). If you are looking for a nice accommodation in Cusco, you should check Hostal Pachacuteq Inn. We stayed there for a couple of days and had a very great time.